Several runners loved its stylish design. A good number of wearers appreciated its excellent grip on paved surfaces. A few testers lauded its quality. Many buyers commented that the shoe was comfortable. Some purchasers mentioned that the shoe has a good quality. A good number of users admired the versatility of the Adidas Alphabounce CK; users noted that they’ve been using the shoe for weightlifting, plyometrics, running and casual activities. Based on observations, Adidas should have used better color combinations for the shoe. According to a buyer, the sole is stiffer when compared to other Adidas shoes. A good number of purchasers commented that the Adidas Alphabounce CK was a comfortable and stylish running shoe. Aside from its design, they loved its excellent quality. Although several of them said that the color combinations were not that great, others still recommended the shoe because of its reliable traction. 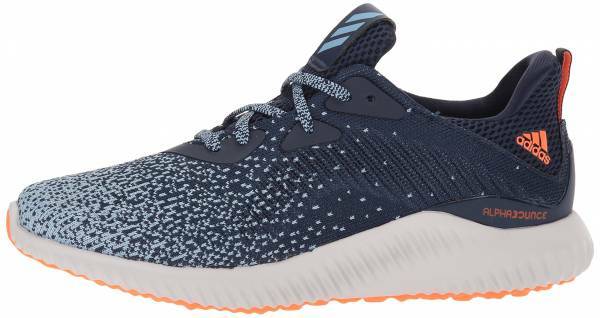 Overall, the majority of the wearers said that the Adidas Alphabounce CK was a good option for those who want quality and comfortable yet casual road running shoe. The Adidas Alphabounce CK is a road running shoe that is intended for neutral runners. It uses the seamless FORGEDMESH upper which aims to deliver a more personalized fit. It also provides proper air ventilation in the foot-chamber. The midsole utilizes the BOUNCE material that provides a more flexible cushioning throughout the run. Utilized in the shoe is the grippy rubber outsole. This component aims to deliver added traction on a wide variety of paved surfaces. The Adidas Alphabounce CK follows the standard shoe measurements when it comes to sizing. The shoe is ideal for those who want to excel in any short and extended road running activities to the next level. Because of its sock-like construction, it can adapt to the foot's natural movement. The available widths are D - Medium for the men's version and B - Medium for the women's version. The grippy rubber outsole is used in the Adidas Alphabounce CK. This durable material provides added traction on paved surfaces. Utilized in the shoe is the BOUNCE technology. This material is more responsive and springy when compared to standard midsole foams commonly used in some running shoes. The platform stretches when pressure is applied, then spring back into its original structure when pressure is removed. The BOUNCE midsole material is also found in the very first shoe release of the Alphabounce series. The seamless FORGEDMESH technology is integrated into the upper section of the Adidas Alphabounce CK. This material ensures the foot to undergo its range of motion naturally. Without any feeling of restriction, it accommodates and expands to the shape of the foot, making it feel more snug and secure. The comfortable textile lining makes it possible to wear the shoe without using a pair of socks. This material is composed of smooth textiles which aid in eliminating possible irritation in the skin. It provides added comfort as well. A snugger fit is offered by the sock-like construction of the Adidas Alphabounce CK. With this component, possible shoe removal is decreased.